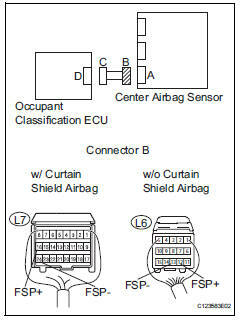 The occupant classification system circuit consists of the center airbag sensor and the occupant classification system. 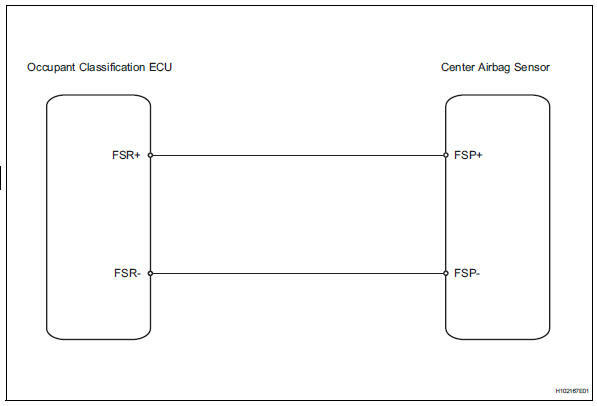 When the center airbag sensor receives signals from the occupant classification ecu, it determines whether or not the front passenger airbag, front seat side airbag rh and seat belt pretensioner rh should be operated. 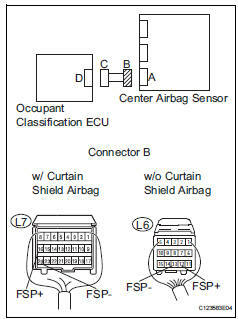 Dtc b1650/32 is set when a malfunction is detected in the occupant classification system circuit. Ok: dtc b1650/32 is not output. Dtcs other than b1650/32 may be output at this time, but they are not related to this check. Turn the ignition switch on, and wait for at least 10 seconds. 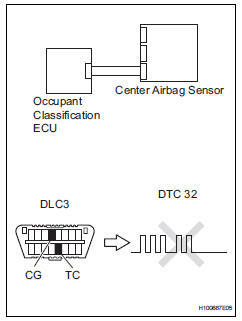 Using the intelligent tester (with can vim), check for dtcs of the occupant classification ecu (see page rs- 249). Ok: dtc is not output. Check that the connectors are properly connected to the center airbag sensor and the occupant classification ecu. 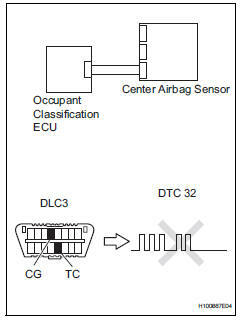 Disconnect the connectors from the center airbag sensor and occupant classification ecu. 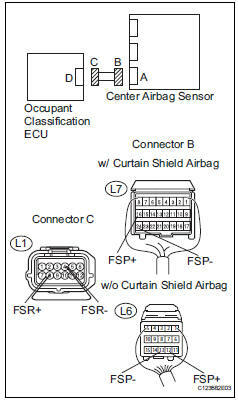 Using a service wire, connect l1-8 (fsr+) and l1-4 (fsr-) of connector c.
Replace the center airbag sensor (see page rs-374). Perform the inspection using parts from a normal vehicle when possible. 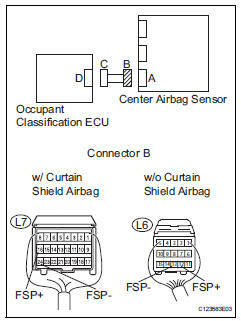 Replace the occupant classification ecu (see page rs- 392). Using the intelligent tester, perform the zero point calibration (see page rs-241). Ok: completed is displayed on the tester. Using the intelligent tester, perform the sensitivity check (see page rs-241).